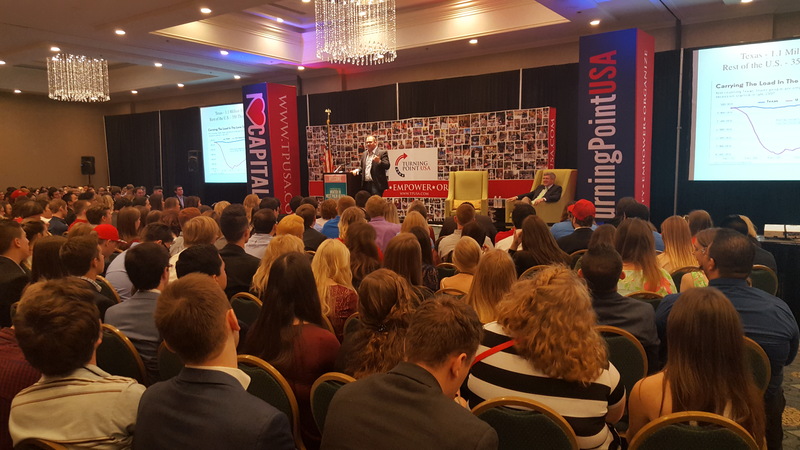 Turning Point dramatically increased their numbers from the previous year, up to 510 students from 300 in 2015 for their first retreat in West Palm Beach. FreedomWorks sponsored the event alongside a dozen other conservative groups, and I had the chance to speak with several Liberty-minded students from within the conservative movement who were interested in potentially interning with FreedomWorks at our DC office. Some of their speakers this year included Donald Trump, Jr., Ben Shapiro, Joe Walsh, Tomi Lahren and Senator Ben Sasse. In addition, FreedomWorks CEO Adam Brandon and FreedomWorks Senior Economic Contributor Stephen Moore spoke together during a panel discussion and Q-and-A session that was most engaging for the group of Millennials. At our booth, I gave away our key initiatives and common core palm cards, Pro-Growth Agenda “problems” and the “solutions” booklets, “7 for ‘17” booklets, and two dozen of Moore’s book, Fueling Freedom, as well as an entire box of t-shirts. I also gave away several criminal justice reform booklets.